Introduction: SPRING/Uganda is promoting the intake and compliance to iron and folic acid (IFA) supplements among pregnant women in southwestern Uganda to reduce anemia levels estimated at 24% at national level and 11% in southwestern Uganda (UBOS & Macro International 2011). Methodology: The Logistics Supply Assessment Tool (LSAT)1 was applied to understand essential supplies for anemia prevention in pregnant women at national, facility and community levels. 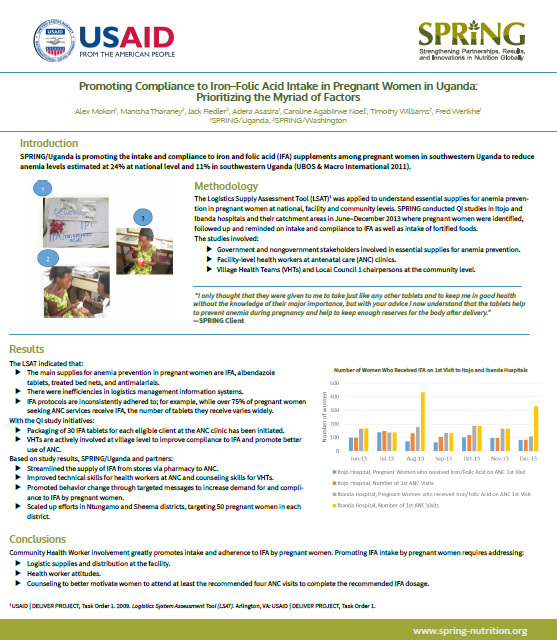 SPRING conducted QI studies in Itojo and Ibanda hospitals and their catchment areas in June–December 2013 where pregnant women were identified, followed up and reminded on intake and compliance to IFA as well as intake of fortified foods. Government and nongovernment stakeholders involved in essential supplies for anemia prevention. Facility-level health workers at antenatal care (ANC) clinics. Village Health Teams (VHTs) and Local Council3 chairpersons at the community level. The main supplies for anemia prevention in pregnant women are IFA, albendazole tablets, treated bed nets, and antimalarials. There were inefficiencies in logistics management information systems. IFA protocols are inconsistently adhered to; for example, while over 75% of pregnant women seeking ANC services receive IFA, the number of tablets they receive varies widely. Packaging of 30 IFA tablets for each eligible client at the ANC clinic has been initiated. VHTs are actively involved at village level to improve compliance to IFA and promote better use of ANC. Streamlined the supply of IFA from stores via pharmacy to ANC. Improved technical skills for health workers at ANC and counseling skills for VHTs. Promoted behavior change through targeted messages to increase demand for and compliance to IFA by pregnant women. Scaled up efforts in Ntungamo and Sheema districts, targeting 50 pregnant women in each district. Logistic supplies and distribution at the facility. Counseling to better motivate women to attend at least the recommended four ANC visits to complete the recommended IFA dosage. 3. USAID | DELIVER PROJECT, Task Order 1. 2009. Logistics System Assessment Tool (LSAT). Arlington, VA: USAID | DELIVER PROJECT, Task Order 1.